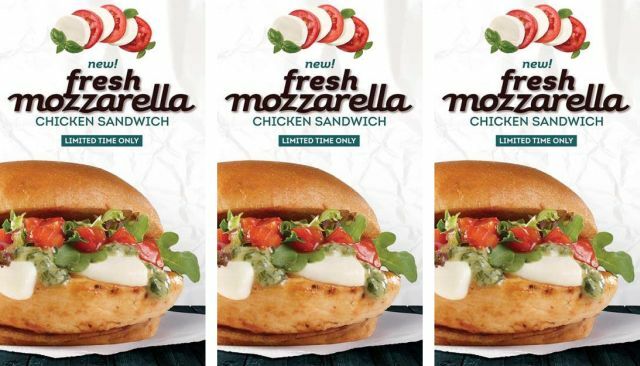 Wendy's adds fresh mozzarella to the menu with the launch of two new menu items in April: the Fresh Mozzarella Chicken Sandwich and Fresh Mozzarella Chicken Salad. 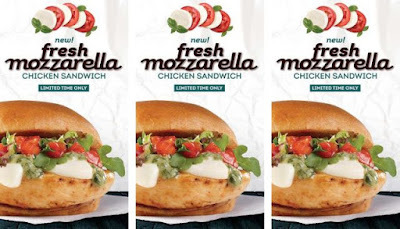 The new, limited-time chicken sandwich features fresh mozzarella cheese, balsamic diced tomatoes, fresh spring mix, creamy basil pesto, and a grilled chicken filet on a toasted garlic brioche bun. It was spotted testing in August of last year. The balsamic diced tomatoes are prepared in each restaurant twice a day. The new Fresh Mozzarella Chicken Salad replaces the BBQ Chicken Salad and consists of a bed of salad blend topped with fresh mozzarella cheese, grape tomatoes, garlic croutons, creamy basil pesto, and sliced grilled chicken (you can also opt for crispy chicken). The price on the salad is $6.49 for a full-size salad or $4.49 for a half-portion (prices may vary). While the new items are not set to officially launch until early April, they're already available at some locations (I'd call to check before making a trip out to try one though). Update 4/14/2017 - The fresh mozzarella is sourced from BelGioioso Cheese, Inc.